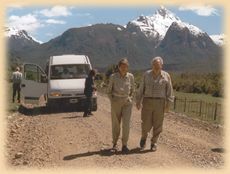 Our trips usually involve overland travel through Patagonia either by four-wheel drive vehicles or minibus, always accompanied by an English- or German - speaking driver (who at the same time acts as guide, mechanic if needed, and above all as an incomparable connoisseurs of the country). In general we try to keep daily travel times under four hours, and only rarely will it be necessary to have a whole day of travel only. In between there is always enough time to rest, to enjoy nature, to trek on foot or horseback, to visit special sites or to undertake other excursions. In this respect, we like to keep our offer flexible. In most areas it is possible to overnight on estancias (big sheep farms, ranches) with excellent facilities for guests, but we also use hotels, hosterias and hostels. In general we pre-book overnight stays with breakfast. 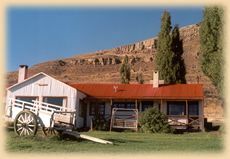 In estancias or hotels these consist of double room with private bath, whereas in refuges in the Torres del Paine National Park frequently there may only be dormitories and shared bathrooms available. A midd-day picnic or packed lunch as well as restaurant dinner may be included if desired. On our trips you will become acquanted with the local cuisine. At noon, since we are far from any restaurant possibility, we take a pic nic with us. On the Patagonian estancias we can try the good lamb barbecues, but also tasty stews and pasta. On the other side, in Chile and Ushuaia, we can enjoy delicious fish dishes. In case you are vegetarian, please let us know before iniciating the journey.